1917: Completed N.V. Burgerhout’s M. & S. Naamlooze Venootschap, Rotterdam (Yd No. ) for Burgerhout & Zn, Rotterdam own account as MAASMOND. 1924: Sold to Reederij J. Frater Smid & G. Prins, IJmuiden. Registered at IJmuiden as ZWARTE ZEE (IJM27). By 1930: Owned by N.V. Vissch Mij “Zwarte Zee”, IJmuiden (Jac. Frater Smid, Overveen, manager). 1935: Sold to Bowden Ramster (64/64), Fleetwood. IJmuiden registry closed. 26.10.1935: Registered at Lowestoft as ALCAZAR (LT87). 10.1935: Vessel mortgaged (64/64) to District Bank Ltd, Liverpool (A). 12.11.1935: First landing at Fleetwood. 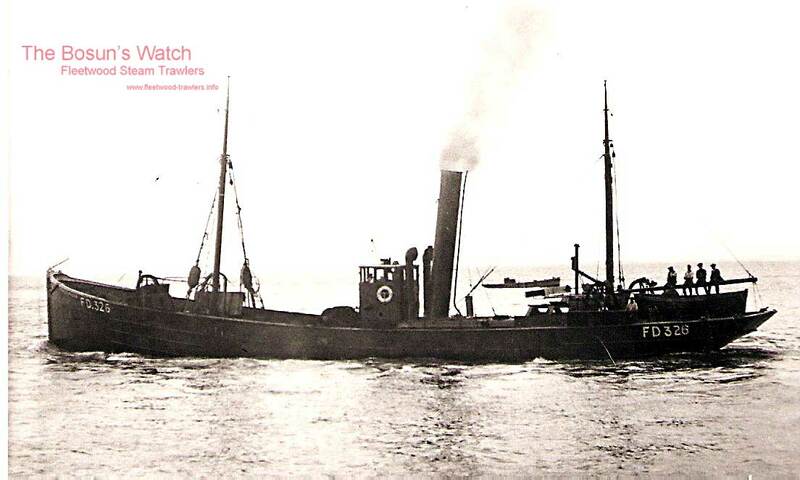 16.4.1936: Off Pembrokeshire coast in collision with steam drifter LANNER (LT1176). 29.7.1938: Sailed Fleetwood for St. George’s Channel grounds (Sk. Ernest W. Swan); nine crew all told and one pleasurer. 7.8.1938: Having fished between the Arklow L.V. and Kish L.V. left the grounds at abou 4.00am. for home. At about 4.30am. entered a dense fog bank with visibility reduced to 100 – 200 yds. At 5.20am. in position 53.19N 5.25W run down by LMS Railway steamer CAMBRIA (3462grt/1921)(Capt Edward Broughton Turner) Holyhead for Kingstown with passengers and mail, striking the trawler amidships on the starboard side after which she quickly filled and foundered immediately before the boat could be launched. Three survivors* including the Skipper and pleasurer picked up by the CAMBRIA. 20.12.1938: At BOT Formal Investigation (No.7927) at Liverpool, the Court found that the said casualty and the subsequent loss of life were caused by the wrongful act and default of Edward Broughton Turner, the master of the s.s. “CAMBRIA”, and that the said casualty and loss of life were not caused or contributed to by any wrongful act or default of Ernest William Swan, the skipper of the s.t. “ALCAZAR” or the London, Midland and Scottish Railway Company. 19/05/2012: Page published. 5 updates since then. 17/01/2017: Added BOT loss inquiry report. This entry was posted in Lost Vessels, Steam Trawlers and tagged Bowden Ramster, Lost on May 19, 2012 by Fred Smith. 1916: Launched by Gebr. Boot, Leiderdorp (Yd No.1031 ) for Naam VennStoomviss “Zaanstroom VI” (P. J. D. & Joh. Dil & S.Yff, Zaandijk, managers) as ZAANSTROOM VI. Pre1920: Sold to N.V. Visscherij Maats “Maastroom II”, IJmuiden (N.V. Scheeps Exploit Maats “Maastroom”, managers). Renamed MAASSTROOM II. 19?? : Sold to ?? and renamed ARIA. Pre1927: Sold to N.V. Zeevissch Maats “Alcmaria”, IJmuiden. Renamed ALCMARIA. 1935: Sold to Bowden Ramster, Fleetwood. 21.3.1935: Registered at Lowestoft (LT48). 30.11.1939: Requisitioned for war service as a minesweeper (P.No.FY.1525) (Hire rate £41.18.8d/month) (Nore/Yarmouth). 30.5.1940: Sailed Yarmouth with twelve other drifters for Ramsgate. 8.1940: Fitting out at Leith. 15.10.1940: Transferred to Royal Norwegian Navy (Rosyth/Port Edgar) with M/S Group 164. 28.11.1944: Returned to Royal Navy. 12.1944: At Dundee minesweeping gear removed. 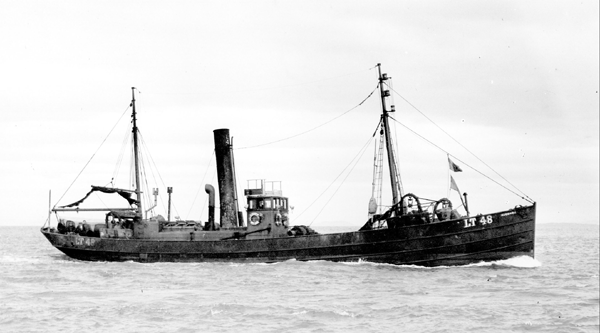 1951: Sold to the Dalby Steam Fishing Co Ltd, Fleetwood (Bowden Ramster, Cleveleys, manager). 4.2.1957: At 9.30 am. disabled with boiler trouble off Maughold Head, IoM (Sk.Leslie Hatcher) requested assistance from DEAN SWIFT (FD29) (Sk. Jack Randles), sheltering in Ramsey Bay. In heavy rain, gusting 56mph, drifted to within11 miles NW of Morecambe Bay Lightship when DEAN SWIFT arrived on scene at 5.30 pm. At 6.00 pm. tried to connect but line parted. 8.30 pm. made SOS. 10.00 pm. Barrow lifeboat launched and RED SABRE (LO71) (Sk. Jim McKernan), outward for the fishing grounds, turned back. 5.2.1957: At 3.00 am. lifeboat stood by while RED SABRE attempted to pass a line by rocket and barrel and was eventually successful only to see line carried away and her propeller fouled. With Barrow lifeboat still in attendance and in moderating weather DEAN SWIFT connected at 5.00 am. and commenced tow to Fleetwood arriving in the afternoon. Boiler beyond economical repair. 18/01/2009: Page published. 3 updates since then. 06/12/2017: Removed FMHT watermark from image. This entry was posted in Steam Trawlers, Steamers (Picture) and tagged Bowden Ramster, Dalby SFC on January 19, 2009 by Fred Smith. 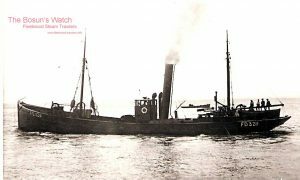 15.6.1901: Launched by J. Duthie, Sons & Co, Aberdeen (Yd.No.226) for Aberdeen Icelandic Steam Fishing Co Ltd, Aberdeen as PRINCESS MELTON. 9.9.1901: Registered at Aberdeen (A440). 9.1901: Completed (J. A. Gordon, manager). 9.1.1912: Sold to Thomas Lauder, Aberdeen (managing owner). 8.1914: Requisitioned for war service as a minesweeper (1-6pdr HA) (Ad.No.322). 5.11.1918: Sold to Ernest Taylor, Noah Ashworth & Rowland Morris, Fleetwood (Joseph A. Taylor, manager). Based Tyne. 20.7.1919: Registered at Fleetwood (FD326). 1921: Sold to Ernest Taylor, Thornton (Joseph A. Taylor, manager). 26.2.1925: Sold to Alexander Jack, Glasgow. 26.2.1925: Sold to Bowden Ramster, Fleetwood (Alexander Keay, manager). 23.12.1925: Sold to Dalby Steam Fishing Co Ltd, Fleetwood (Bowden Ramster, manager). 1932: Sold to Thos. W. Ward Ltd, Sheffield for breaking up at Preston. 12.10.1932: Fleetwood registry closed, advise received from owners “Ship broken up”. 18/06/2017: Removed FMHT watermarks from image. This entry was posted in Steam Trawlers, Steamers (Picture) and tagged Ashworth Morris & Taylor, Bowden Ramster, Dalby SFC, Ernest Taylor on January 17, 2009 by Fred Smith.